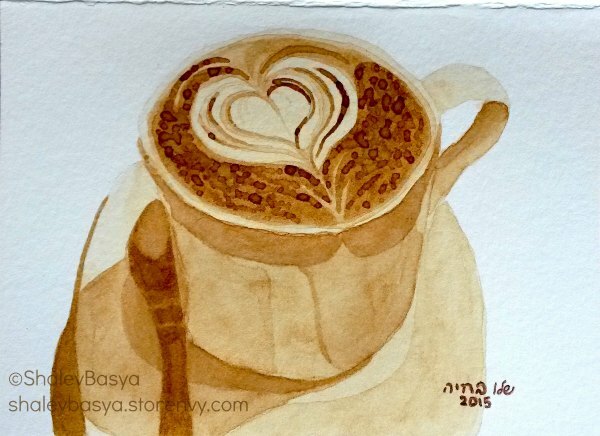 So, while I enjoy painting with coffee and tea, I also enjoy drinking it. Pumpkin spice lattes are one of my favorite coffee drinks. I found this Pumpkin Spice Latte Syrup recipe and I thought I’d share it with you guys. I found it online somewhere. 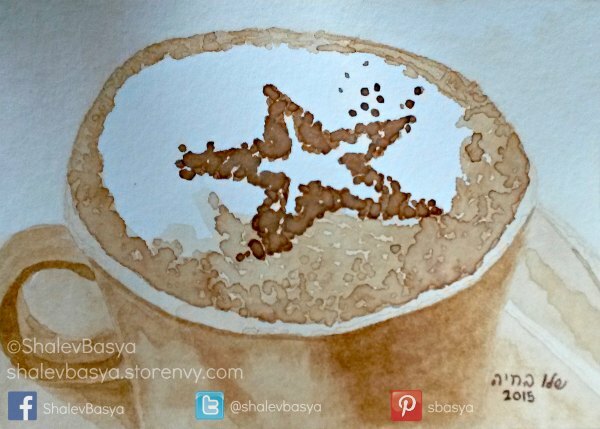 Since there’s not many places to get kosher lattes where I live, this recipe is very helpful. • 1/4 cup canned pure pumpkin *I added an extra spoonful. 1. Prepare the syrup: Bring the sugar and 2 cups water to a simmer in a medium saucepan over medium heat, whisking, until the sugar dissolves. Add the cinnamon sticks, pumpkin pie spice and pumpkin. Simmer, whisking occasionally, about 5 minutes. Remove from the heat. Set aside 5 minutes, then strain twice through a fine-mesh strainer into an airtight container. Refrigerate until cool. Store in the refrigerator for about 1 month. You’ll end up with about 4 cups total. 2. For each latte: Microwave the milk on High about 1 minute or until very hot. (Transfer to a blender and blend 20 seconds for extra frothy milk, if desired.) Put 1 to 2 tablespoons pumpkin spice syrup in the bottom of a mug. Top with the coffee and warm milk. Garnish with whipped cream and pumpkin pie spice, if desired. Since I don’t have a way to make an espresso shot, I just use instant coffee. Put the amount you would normally use to make a cup of coffee, and then use just enough water to dissolve the crystals. It’s obviously not as wonderful as an actually espresso shot, but it works. Then I can have a pumpkin spice latte while painting with coffee. It makes for a wonderful time! I’m sorry I haven’t posted recently. I’ve been dealing with some medical issues, but I have two new paintings to share with you. Here’s another raspberry tea painting. This one’s an 8×10. I love the little tea cups you get when you go to an Asian restaurant, and having them all in a line kind of went along with the Asian theme of having everything perfectly presented. I just got a box of various fruit teas, so I’ll be experimenting with those in the near future. Make sure sure to check back to see how that goes. 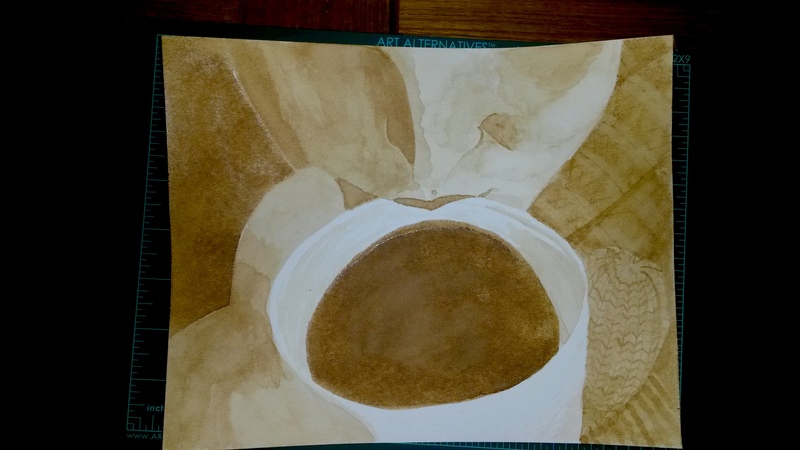 I had first attempted to redo the coffee painting I did for my mother’s card since it came out so wonderfully, but I know better than that. Redoing paintings never works out for me. Hopefully I get a better camera eventually so I can do prints. Instead, I did this little guy. He’s a little 5×7 cappuccino with a star on top. My husband commented about how “fun” it was when he walked by as I was painting. Anything he calls “fun” means he likes and enjoys it. After the frustration of my last coffee painting, I needed some tea time. I tried chai at first, but I couldn’t get a dark enough pigment with that either. So back to raspberry. I need to get some more fruit teas and experiment with those. I started out with a light drawling. The actual drawling is lighter than this. I just hyped up the contrast in the photo so you could actually see it. I don’t drawl everything. Just enough to know where to put my base layers. 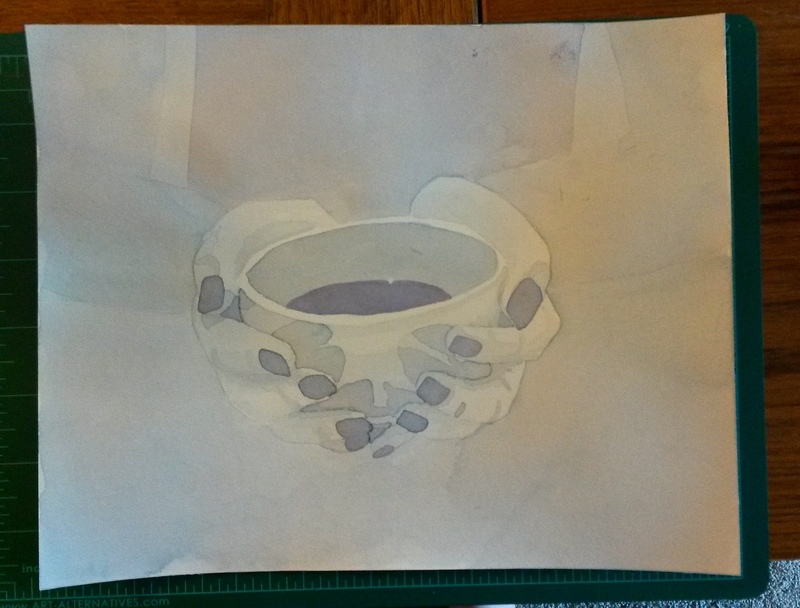 Here are the first layers, getting the form of the cup and the hands. 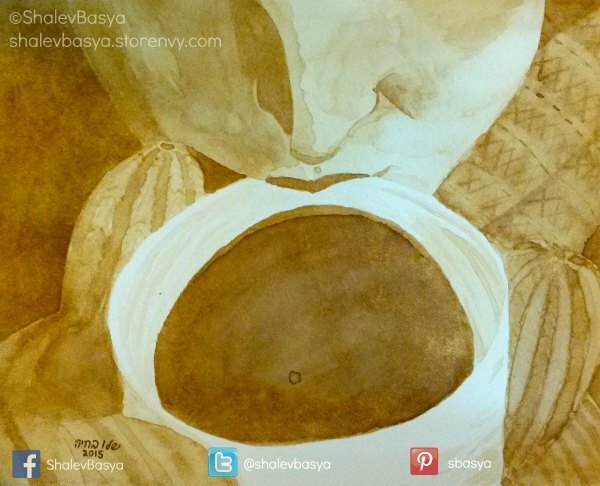 The tea dries slower than the coffee, so my tea paintings take longer than my coffee paintings. Now for some more layers and definition. Painting with the raspberry tea is always an interesting experiment. 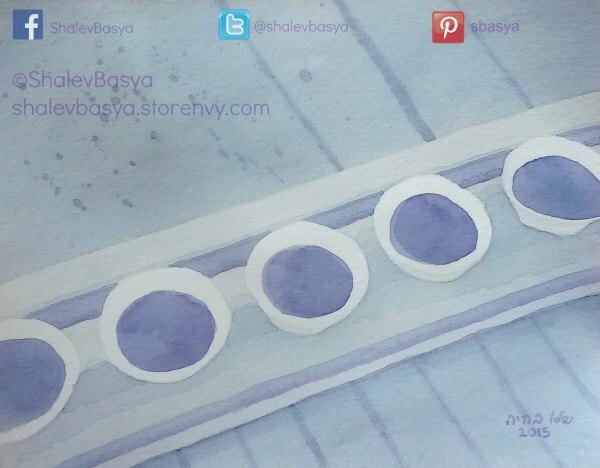 Parts of stay a grayish blue, and then darker areas turn various shades of purple. I was happy with the amount of purple I was able to get into this piece. 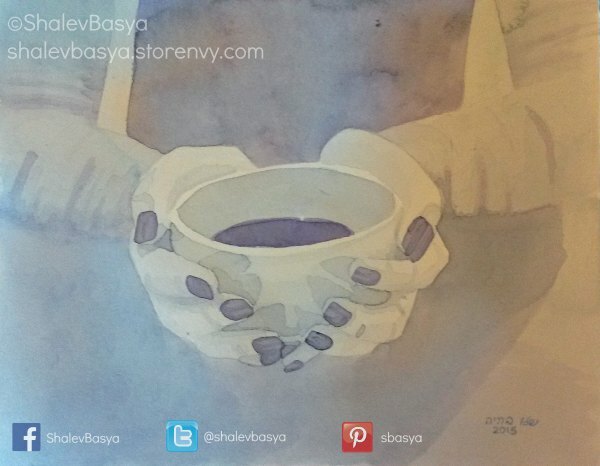 I think it’s kind of become my signature to always have cup in my painting, which I’m fine with. So maybe once I’m able to do larger pieces. (I have better supplies. 🙂 ) I can be more clever with my cups. Perhaps this was a bad time to do this particular piece. I have been busy with other things. The little one is making me all uncomfortable, and I’ve started the nesting phase. I want everything done now. I want the baby’s room done and everything washed and cleaned. There’s only one problem. … I’m not superwoman. So on top of my pregnant emotions and all the stuff I want done, let’s just throw on a complicated painting. That sounds smart. I wanted to do something a little different from the still life I have been doing lately, but I still wanted a cup in the painting. This one was definitely more frustrating than my other ones and I wanted to burn it a few times. I put some detail in and then took it out, and then put some back in and then some back out. The mittens were what I was having the most problems with. I just could figure out the right amount of detail. I needed to show that they were mittens, and show the form, but too much detail just took away from the piece. I think it was because I wasn’t able to get the detail I wanted in the face. I couldn’t get the contrast I wanted because the darkest layers were maxed out in the layers of coffee they would take. 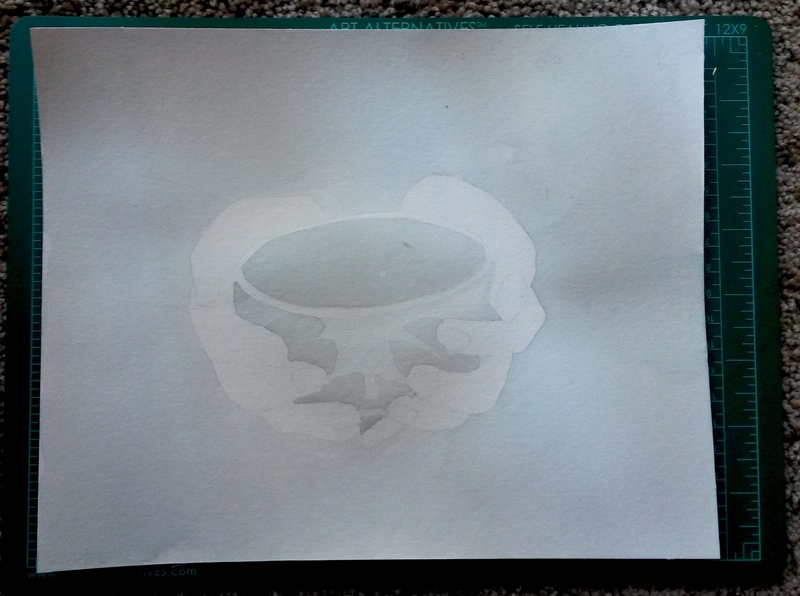 I’m hoping that once I get some money, I can test out some watercolor canvas boards and see if those take more coffee layers than the paper. Here’s the finished piece. I gave the nose a little more definition and took out some of the detail I had on the mitten. 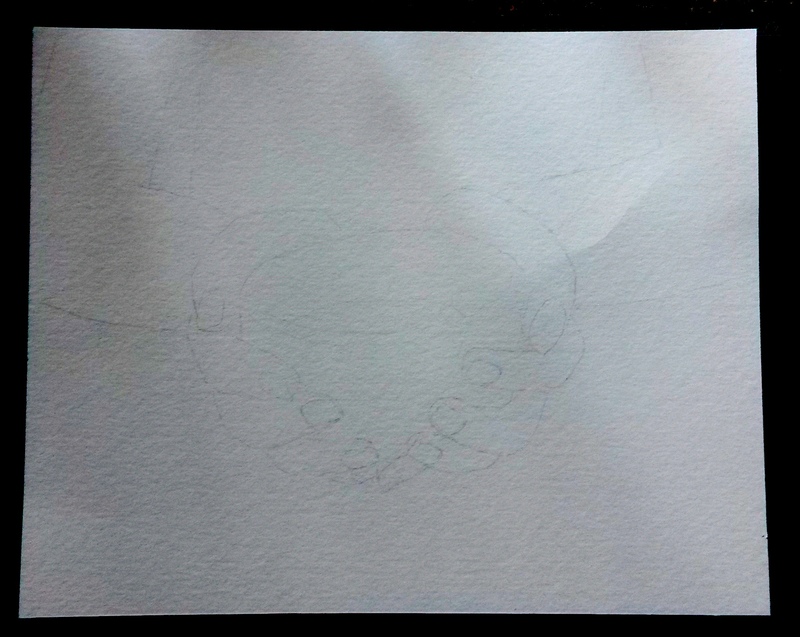 Hopefully next time I do a piece this complicated, I have found a better surface that can take more layers.